like opera and theatre performances, shows, concerts and musicals. but without all the complicated studio or production truck technology. The revolutionary live editing module creates a sequence with full group functionality from your multicam live mix for immediate further editing with a post-production system. Detects transitions and adds them to the timeline! The intuitive Touchpad Control Desk is the first of its kind in the world for the live editing of TV and stage productions. Live feeds can be accessed and edited directly via the touch screen: What you touch is what you get. The mixer uses just one button to control the preview and cut track (mobile, studio or production truck): ideal for recording all events that follow a fixed sequence (score, script, text, etc.). 12 channel wireless tally light system for ENG cameras ect. Brightness of front LED and eye cup LED individually adjustable. 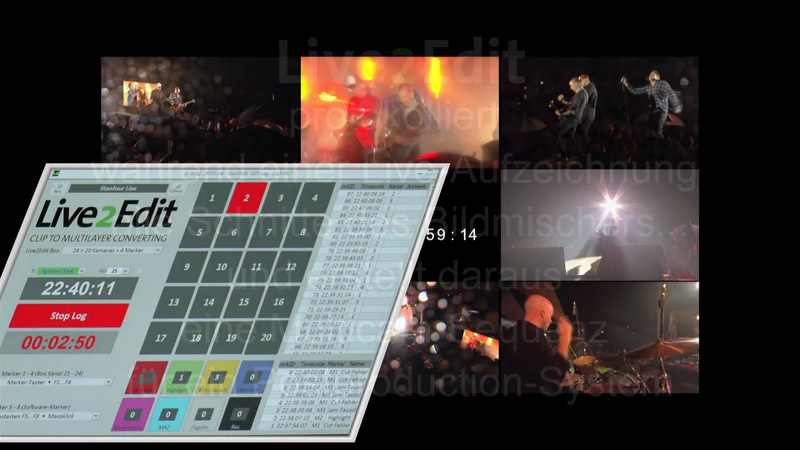 Our innovative Live2Editsystem is also available in a rental version. This allows you to benefit from all the advantages (your live multicam stream in the timeline = considerably shorter post-production time = cost savings), but does away with the need to hire an operator from us. 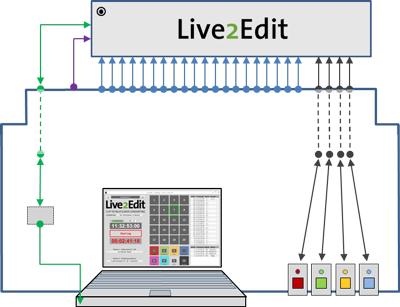 You can simply use the system yourself: Live2Edit is therefore even cheaper than before. Our Live2Suite represents a proven innovative, modular solution that was developed for high-quality TV and live productions based on extensive experience. The Live2Line company was founded by highly experienced TV and live production professionals. Our objective is to give TV broadcasters, production companies, event agencies and theatres a new technical system which allows them to make top quality productions – at significantly lower cost and in less time than before. is known in Germany and beyond for his high-quality adaptations of stage productions (Burgtheater Vienna, Kammerspiele Munich, Thalia Theater Hamburg, Deutsches Theater Berlin) and documentaries about exceptional artists (Katja Wünsche, Martin Stadtfeld, Rolando Villazón). Twice nominated for the Grimme Award, and winner e.g. of a Bavarian TV Award (2001), the Bronze World Medal in Performing Arts New York (2007), the Deutscher Kamerapreis (2007), and the German Record Critics' Award (2009). has staged numerous theatrical, operatic, musical and puppet-theatre productions in Germany (including Oper Frankfurt, Theater Freiburg), written a number of children's and youth theatre pieces (including Sofa Trilogy, Damned positive). From 1985 to 2005 he was a partner and member of the Klappmaul Theater ensemble (Hessischer Kulturpreis 1996, Ehren-Kleinkunstpreis 2005). He founded Sofa-Film GbR in 2005 together with three other idealists. Interested in taking a closer look at the Live2Suite or one of its modules, or in booking it for your TV or stage production?